How Do You Keep the Cattle's Water Trough Clean? Keeping a clean, clear water trough is a basic part of providing adequate daily care for your cows. Clean water helps keep your cows well hydrated and healthy. 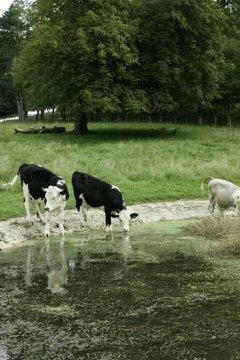 Algae naturally forms in stagnant water and the dirty trough problem will be compounded by various seeds, weeds, slobber and whatever else your cow has in or around her mouth whenever she reaches into the trough to take a drink. Drain all of the old water out of the tank. Dump or scoop any remaining debris out of the tank. Spray bleach or vinegar into the trough as a disinfectant. Scrub down the inside of the water trough with your scrub brush until the trough is cleaned to your satisfaction. Rinse out water trough with a hose and refill it with clean water. Repeat process every two to three days or as needed. Regular cleaning and scrubbing is the only truly effective way to keep your cow's water trough clean.  Adding a specially designed cattle trough filter to your trough can help keep your water trough clean for longer periods of time in between cleanings and minimize the amount of cleaning you need to perform regularly.  You can use a commercial cleaner such as bleach to clean your water trough, but you need to be very thorough in rinsing out the trough if you do. You do not want your cows accidentally drinking bleach or other chemicals. Vinegar is a natural, non-toxic disinfectant that is safe to use around your cattle and will not harm your cows if a small amount is left behind in the tank after you finish cleaning. ABC Health and Wellbeing: Does vinegar really kill household germs? Jen Davis has been writing since 2004. She has served as a newspaper reporter and her freelance articles have appeared in magazines such as "Horses Incorporated," "The Paisley Pony" and "Alabama Living." Davis earned her Bachelor of Arts in communication with a concentration in journalism from Berry College in Rome, Ga.
What Is Used to Muck Out Horse Stalls?